Home / Trading / Trading Advice / Is Aurora Cannabis the Best Pot Stock to Buy? Is Aurora Cannabis the Best Pot Stock to Buy? Cannabis stocks are an extremely entertaining industry in the stock market at the moment. As names like Aurora Cannabis (NYSE:ACB) swing in and out of favor, we get an incredibly real, incredibly raw trading environment. It’s truly a sentiment game that allows investors to play the ups and downs in names like ACB stock as they come. But that doesn’t mean that these companies don’t run viable businesses. They certainly do. Otherwise we wouldn’t have companies like Altria (NYSE:MO), Constellation Brands (NYSE:STZ) and others making multi-billion investments in them. As these products continue to gain regulatory approval, there’s a lot of top-line growth to go around. Is ACB stock the best positioned to harness it? On January 8th, Aurora announced preliminary results saying it expects fiscal second-quarter revenue of $50 million to $55 million, up about five-fold from the same period a year ago. That’s the type of growth that’s got investors excited. On the same day, a top cannabis analyst said she expects the U.S. cannabis market to be an $80 billion industry by 2030. The analyst, Vivien Azer of Cowen, was most optimistic on Canopy Growth Corp (NYSE:CGC) and Tilray (NASDAQ:TLRY) this year based on demand from Canada, but that didn’t stop investors from snapping up the entire industry. The fact that it came on the same day as ACB’s preliminary results was like adding fuel to the fire. Shares went from $5 that morning to $7.50 within a week. The fact that it’s cooled down a bit shouldn’t surprise anyone and it’s definitely got bulls wondering if this is a buyable pullback. With a $6.2 billion market cap, ACB isn’t small but it’s smaller than some of its peers. That does make it ripe for potential investment partners, but it also makes it expensive as well. In fiscal 2018, ACB had $55 million in sales. Let’s be super optimistic and say it achieves five-fold growth for the whole year, meaning it generates $275 million in sales. At that price, it still trades at 23.5 times 2019 sales. That said, ACB isn’t a bad play on the cannabis market, but it’s hard for me to not like one of the industry’s most well-known players at this time, Canopy Growth. With a $4 billion investment from Constellation Brands, it has the backing of a high-quality alcohol company with proven leadership and distribution channels. So how do we trade ACB stock, which rallied some 50% in just a few days from $5 to $7.50? Shares have retraced just over 50% of that move, now trading near $6.20 a share. ACB stock peaked around $12 in January before going on an extended decline. Shares finally bottomed out just above $4 in mid-August before reversing higher. 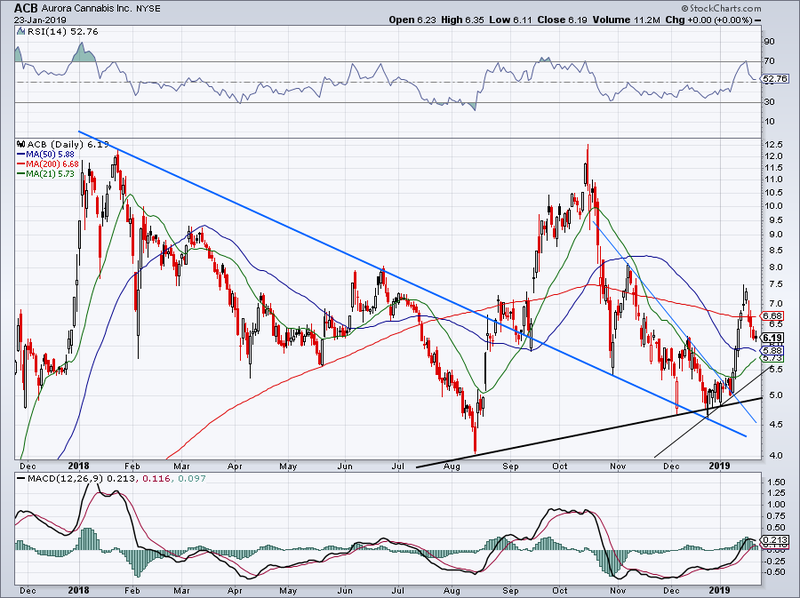 ACB again ran to $12.50 before reversing lower, this time finding support on prior downtrend resistance (blue line). Shares are now putting in a series of higher lows, creating both long-term and short-term uptrend support lines (black line). Obviously ACB is a speculative trading vehicle, so investors should expect big moves in both directions. With that said, with ACB over the 21-day and 50-day moving averages as well as both levels of uptrend support, bulls can justify holding their long position here. Conservative ACB bulls may want to wait for a further pullback, though. 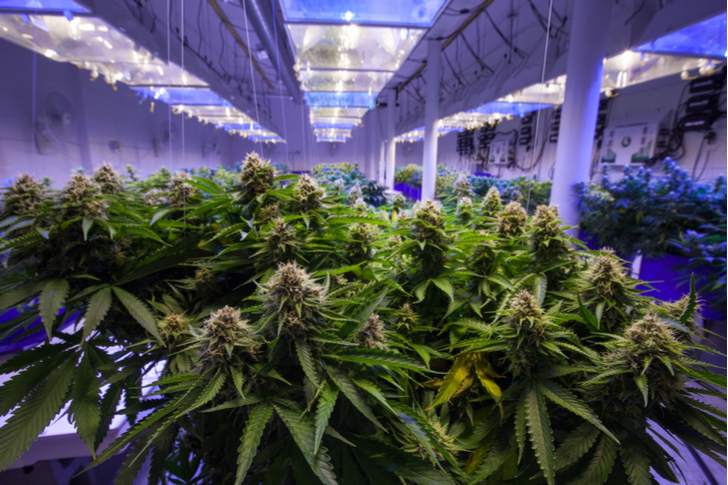 Article printed from InvestorPlace Media, https://investorplace.com/2019/01/is-aurora-cannabis-the-best-pot-stock-to-buy/.